2017 Excel Calendar Templates with popular and Australia Holidays. Calendar files are in xlsx (macro-free) format and compatible with Google Docs and Open Office Calc. Calendars are blank and printable. They are ideal for use as a spreadsheet calendar planner. All calendar templates are also OpenOffice compatible. Need to make a web page calendar? Just 'Save As' HTML from Excel. Full year 2017 Calendar with Australia Holidays. Full-year Calendar in Weekly & Monthly layouts. Makes it easier to find us again! For following year calendars with Holidays see:2018 Calendar with Australia Holidays in Excel format, 2019 Calendar with Australia Holidays in Excel format.For prior year calendars see:2016 Calendar with Australia Holidays in Excel format. Display Holidays for up to 10 countries including: Australia, Canada, France, Great Britain, New Zealand, Spain & South Africa. Import Microsoft Outlook Calendar, Google Calendar & Ical Calendar data. 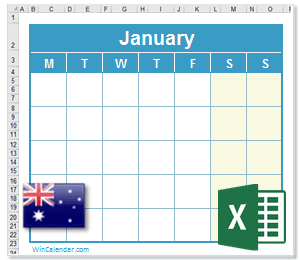 WinCalendar integrates with Microsoft Office (Word & Excel) and comes with a free date picker pop-up calendar!